But the fact that the platform that was home to Phantasy Star, Wonder Boy, Fantasy Zone, and Alex Kidd wasn’t popular in the U.S. means that Sega of America’s release lineup is small enough that collecting it all seems fairly doable; its 114-game library is minuscule compared to the seven-hundred-odd game libraries of the NES, SNES or Genesis. And it’s relatively inexpensive. The Holy Grail of U.S. Master System releases is, I kid you not, James “Buster” Douglas Knockout Boxing, and you can buy a complete copy for under $500. Yeah, that’s a ridiculous amount of money for a trash game, but it’s a far, far cry from the $30,000 complete-in-box copy of Stadium Events that makes collecting a complete set of NES games a totally unreachable goal for all but a tiny fraction of collectors. 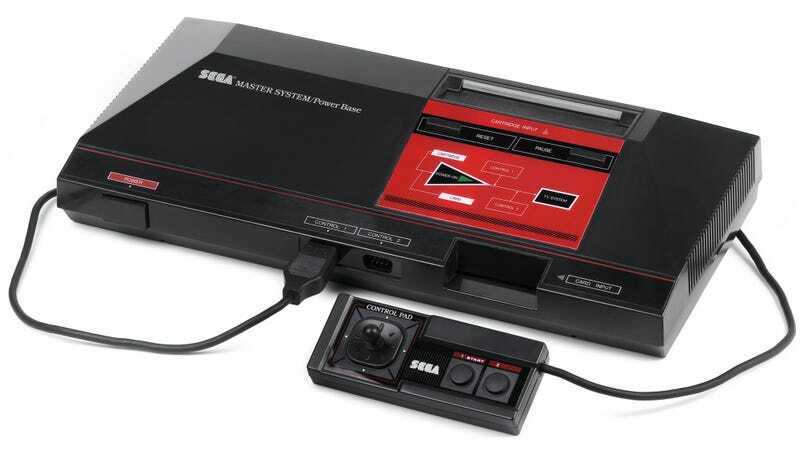 Unlike most other consoles of the time, the U.S. Master System could also play European game cartridges without any issues. Some U.S. retailers took advantage of this fact to import European games and sell them here. Anecdotally, I can certainly say that I saw lots of Euro releases back in the day during trips to Toy Liquidators, the bargain outlet of Kay-Bee Toys. That packaging looked identical at first blush, but you could tell because the back of the box, and the instruction booklets inside, were written in about eight different languages, seven of which were not even English. Double Dragon. All screenshots in this story are courtesy VGMuseum. What this means is that, to an extent that I’ve found to be greater than any other game machine, the supply of Master System games on American shores is lousy with European versions. This isn’t as much of a problem when it comes to games without American versions. But in my case, for a while after I started collecting in earnest, I believed that I already had the U.S. version of Double Dragon, which I got at a yard sale when I was a kid. Until one day I flipped it over and saw a whole Rosetta Stone on the back. Crap. One of the great things about the Master System is that the games were packaged in sturdy, permanent plastic clamshell cases. So even the, I’m just going to say it, monsters who threw away their cardboard NES game boxes would hold onto these. So while the usual state of a vintage NES game in 2017 is “naked,” you’re actually much more likely to find Master System games in their boxes than loose. And they look amazing on the shelf, thanks to the uniform box design. Of course, while said cases had a handy slot to keep the games’ manuals, it’s these flimsy leaflets of paper that most often go missing, or get destroyed, or elsewise get separated from the games they belong to. I started my collection a leg up on the rest, I thought, because I already owned R.C. Grand Prix, one of the very few third-party games on the Master System, and difficult to find, in the box. Now all I needed was a manual! Fat chance. I had an eBay saved search going for years and turned up nothing. Today, a search for “Master System” in eBay’s “Video Games - Manuals, Inserts, and Box Art” category turns up a measly 22 items, only 2 of which are actually manuals. This was how I learned the true path of the completionist Master System collector: To get a manual you’re missing, the cheapest, most convenient way to do it is to just buy a complete copy of the game, and sell or trade the duplicate. At some point in the Master System’s life, Sega of America started releasing games with blue cartridge labels instead of red. Most of the games were released in two different versions, but the games Alex Kidd In Shinobi World and Slap Shot were only released with blue labels in the U.S. Got a copy, but the label is red? Oops, it’s European. And of course there’s no way to know this at all without digging into game collecting forums and reading up on all the weird variations, since it’s not as if Sega maintained any official archive. Once the Sega Genesis started to get rolling in the early 90s, Sega of America could finally stop pretending to care about the Master System. In 1991, winding things down, it released four more games in what were at the time fairly bankable franchises: Golden Axe Warrior, Strider, Spider-Man, and Sonic the Hedgehog. Yep, the Master System had its own version of Sonic. This time it was Sega that took advantage of the compatibility between U.S. and European game carts: Instead of designing and printing all-new boxes and manuals for what were going to be limited-run shipments for the few remaining Master System die-hards, Sega hit upon what was quite frankly a pretty smooth money-saving maneuver: It took the European versions of the games that its continental counterpart was selling and put stickers onto the cases that covered up the European Article Number bar code, replacing it with the Universal Product Code used for American retail stock keeping. So even if you have a copy of Sonic, you may then find out that the copies of the game distributed by Sega of America have a UPC sticker on the back, which yours doesn’t. And a version with the sticker costs about 10 times as much as one without. What you do then is up to you. Some people—even the sort of people who would spend $500 on a copy of James “Buster” Douglas Knockout Boxing—see paying hundreds of dollars for a UPC sticker as a ridiculous waste of money. But then you also have people who, knowing that something exists, simply must have it. Wonder Boy. Yes, it’s the same game as Hudson’s Adventure Island on the NES. I took the middle path. Oh, I bought the stickers. But I figured that they were so unremarkable in their appearance and so obscure in their lack of notoriety that if I was patient, I could probably snag games with the sticker at close to the price of games without the sticker. This was true, although it’s less true today than it was 5 years ago. This might be an excellent time to take a step back and acknowledge that if you’re not a collector, absolutely everything described in this piece sounds utterly ridiculous. It’s a safe bet that most of you reading this, far from being hung up on whether or not someone should pay money for a tiny UPC code sticker, can’t even fathom what would bring a person to want to buy all the games on a single platform, even the bad ones. The box art for the game Black Belt is literally a drawing of a foot. Who would want this? After all of this effort, of meticulously scrubbing through auctions, matching up game boxes, hunting down manuals, and debating the obscura of label color variations with men named CREAMTHERABBIT_420 on unmoderated Internet forums, you’ve done it! You’ve assembled all 114 U.S. Sega Master System games! Now to invite your friends over and oops, they don’t care because they never had a Master System back in the day anyway. But hey, maybe they’ll come around when you tell them that your version of Double Dragon has a two-player mode even though the NES version didn’t. Also Alf. Nintendo didn’t have Alf!